After the “Total Orange” and “Triple Black” alternatives. Last week, Nike’s Shox TL images surfaced in “Total Orange” and “Triple Black” colorway options. Now, the model from 2003 aims to expand its portfolio with a crisp white iteration. Appropriate for the first full day of spring, the silhouette’s upper matches its shox cushioning technology in crisp white. The sneaker’s clean canvas is complemented by metallic silver accents found on the eyestays, outlining each side panel’s Swoosh logo and on the heel in a reflective manner. Lastly, small touches of orange are applied to the tongue and heel’s Shox insignias to complete the colorway. 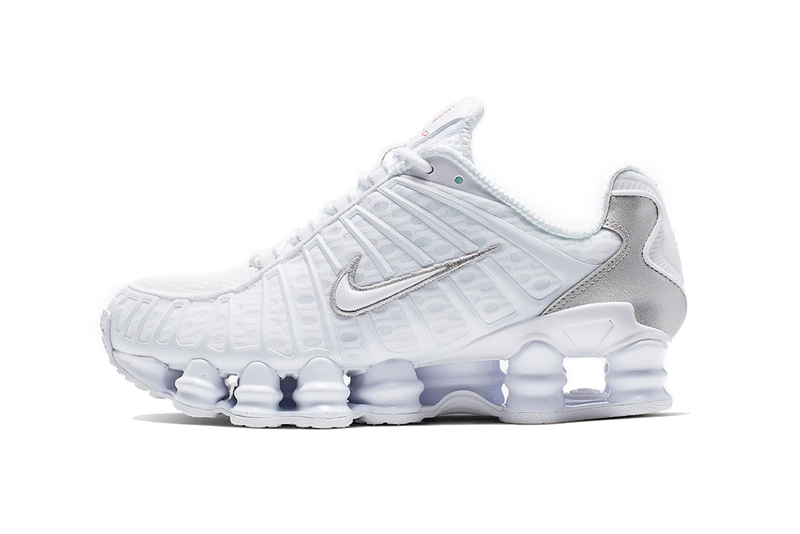 The Nike Shox TL in “White/Metallic Silver” is expected to arrive in the coming weeks at select Nike Sportswear retailers and Nike.com for $170 USD. Fans of Nike’s modern technology can take a look at the Air VaporMax Plus’ “Game Royal” edition. The song originally sent Ezra Koenig into panic mode. Complementing the Air Jordan 1 Mid. Sensei Lawrence tries to undo the sins of his past. A series of coding and scripts led his page to influencer status. Taking place at London’s Design Museum.